I must admit this was a find from Pinterest which of course is a great place to find ideas for just about anything. If you aren't following my Pinterest boards yet please pop over there and follow Beachside Stampers and Jenn Van Wart. This is my version of a fun Snowflake wreath. 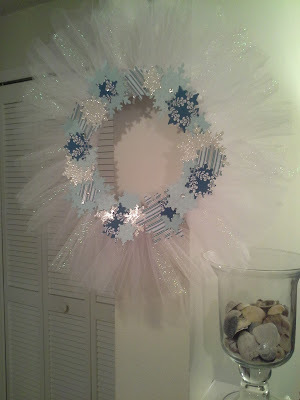 I think it gives a little bit of sparkle with a little bit of class and was very simple to make. 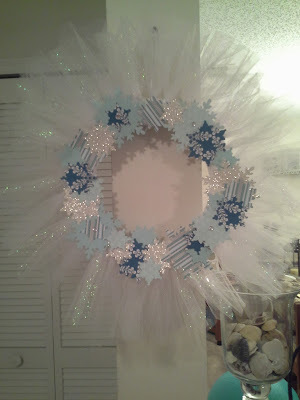 You can really do this with any color you would like and make the tulle more fluffy by just adding more strips of tulle. If you have any questions regarding this project or need any help please feel free to contact me at beachsidestampers@yahoo.com. Thanks for stopping by and I hope you have a great day!